I have done my school days in roughly chronological order, so I am left with the Sixth Form at Ilford County High School. But because it’s been a bit rambling, there will be lots of other leftover bits as well! You will, of course, have read Parts One, Two, Three and Four already. I have described the school and its location but have only recently found this picture. It shows the school frontage, which is largely unchanged today and the local church that we sometimes used – for inoculations, medical visits and GCE O Level oral examinations. But also shows this large rough field to the front. You will remember, from Blog  that fireworks on the Fifth of November used to be much more common. This feature would have a rough bonfire and some of the boys might gather with bangers. Organized Fireworks night events were unusual – they were just informal gatherings. It was assumed at Ilford County High School (ICHS) that all students would move on to the Sixth Form to study selected subjects at A Level and there were very few exceptions to this rule. There was just one boy in our class who left after O Levels. GCE A Levels were the only option for us. (AS levels did exist but I never heard of anyone taking them. The other qualifications below degree level were OND, HND and HNC. There were Further Education Colleges doing things like these.) A few scholars who failed to achieve the necessary grades could re-sit and catch up later with A Levels. The general standard – for continuation into Sixth form, or for many jobs elsewhere – was five subjects at O Level, including English Language and Mathematics. As for O levels there was no element of coursework in our studies. I will do things the other way round and start with the options available to us, the classic subjects which were more or less the only subjects generally available at University, so they were the main subjects available at school. There were the sciences: Physics, Chemistry, Botany and Zoology; Pure Mathematics and Applied Mathematics; Languages: English (which at A Level meant Literature,) French, German, Spanish, Latin and Ancient Greek; and the arts and humanities: Art, Geography and History. For the Sixth Form we picked three subjects. Probably not every possible combination was available. Those doing Mathematics generally did four, like me, usually Pure Mathematics, Applied Mathematics, Physics and Chemistry. AS Levels have come into use as the first half of A level courses and the School now starts the Sixth form with four AS subjects selected from quite a long list. Their web site suggests that any combination of four subjects is acceptable. These are usually cut to three in the final year for A Level study. With more stress now on real life and business, they have the three additional options of Economics, Government and Politics, and Design Technology (Product Design). I think it was pretty good back in the sixties! Then, as now, the Sixth Form was different. We were taught in much smaller groups in a way that was slightly more relaxed and informal. (I suspect that all teaching is much more informal nowadays!) We had free periods when in theory we did private study and the Library was allocated for this use. I am not sure to what extent we were allowed to leave the school in free periods but we certainly did sometimes. We used loose-leaf files instead of exercise books. There were some other things in the timetable. There was a new thing called ‘Use of English,’ for one period a week with an examination at the end of the Lower Sixth. It was designed, I think, to side-track English O Level for non-native speakers of English – it may have included an oral exam. There was also something called General Studies, which covered some odds and ends of real life to avoid a blinkered sphere of study. (Don’t ask me what was included. Perhaps politics, economics, British Constitution, current affairs.) The School now includes an AS subject called Critical Thinking which develops analytical and writing skills it develops. This looks like the successor to General Studies. It was at the height of the importance of Russia and the USSR and we had a teacher who I think came back from a year learning the Russian language. When I started in the Lower Sixth, there was an optional O Level Russian course available. Back to subjects – I have left until last those I did at A Level and next on my list is Mathematics, always known as Maths. (US: Math) I think I always knew that I would go on to study Maths at university. It was always my favourite subject but I can’t remember the particular Maths teachers. It was just Maths up to the Fourth Form, taking O Level Pure Mathematics early, then Additional Pure Mathematics and Applied Mathematics in the Fifth Form – and Pure and Applied for A Level. I think Mr Taylor, the deputy Head (known as Gat) taught some of the A Level Applied Mathematics. I remember Mr Rigby as a Maths teacher but I am not sure if he actually taught us. He was near to retirement and, in a time when all teaching was done on a blackboard, he was allergic to chalk dust. He wore gloves when writing on the blackboards and would write everything for the day before lessons started. I need to go back to the earlier years of Maths, when we did algebra and geometry and the geometry include various constructions with triangles and circles – things like bisecting angles and bisecting the sides of triangles. 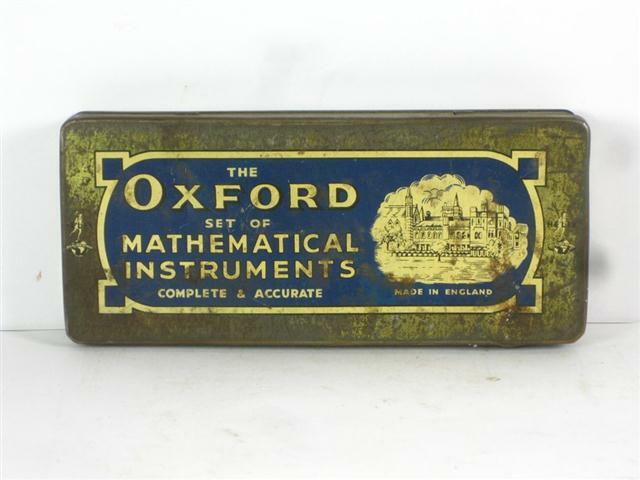 We all had geometry sets, often in a little tin like the picture above. 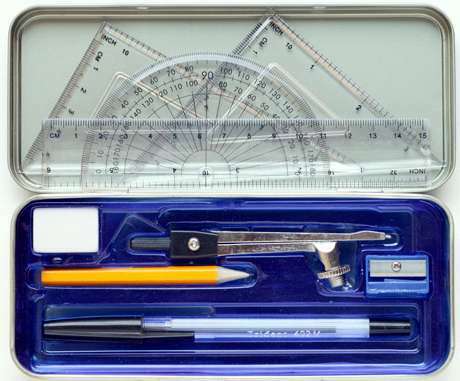 A geometry set always contained two set squares (US: triangles) of different proportions (90-45-45 and 90-60-30), a protractor for measuring angles up to 180, a pair of compasses for drawing circles (now sometimes just called a compass), and dividers (like compasses but with two points). It may also have included a six-inch ruler, coloured pencils and a pencil sharpener. The picture above is, of course, far too modern. Set squares, protractors and rulers were wooden, not plastic, buy otherwise modern equipment is similar. We did trigonometry round about the Third Form and some calculus in the Fourth Form. I think our syllabus reflected changes so that the calculus was new. For A level much of what I remember for Pure Mathematics was more calculus – including trigonometric expressions and natural logarithms. For Applied Mathematics we did uniform acceleration, statics and friction – basically mechanics. There was none of the statistics which has come in later to the syllabus. I can’t comment much on how the teaching of Maths has changed except to say that by the early eighties (when I taught for a few years) it had changed little. In the eighties calculators had replaced logarithms and slide rules, probability and statistics were included, but the basics were similar using textbooks. There was a very popular combination of Pure Maths, Applied Maths, Physics and Chemistry and those were the subjects I did. For Chemistry I am pretty sure that we had the same teacher through O Level and A Level but I can’t remember his name. For reasons that were not clear, we did O Level Chemistry half a year early, in January – presumably to allow more time for the A Level syllabus. Chemistry was heavily based on practical experiments – something like two theory periods each week and two double periods of practical experiments. I definitely preferred practical lessons. There was a Junior Chemistry Laboratory (JCL) for O Level and Senior (SCL) for A Level. Chemistry theory seemed relatively boring – just a new element every week – reading about its sources, mining and extraction and uses etc., just reading learning by rote from textbooks. 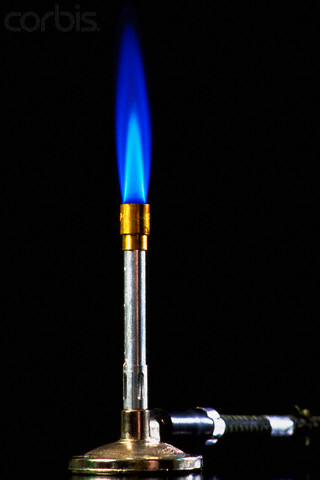 Practicals, done in pairs, involved chemicals in conical flasks, burettes, pipettes, Bunsen burners and litmus paper. 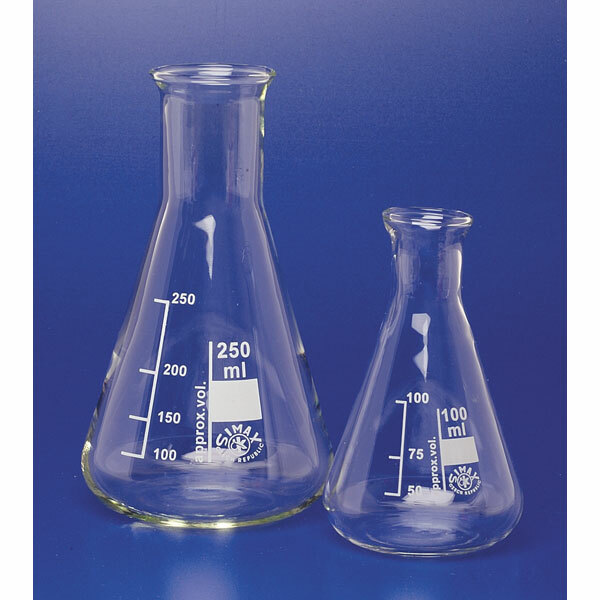 (Pictures above of conical flasks and a Bunsen are far too modern.) We always wore our own white lab coats for practical lessons. For Chemistry we also had to supply a small metal spatula at our own expense. 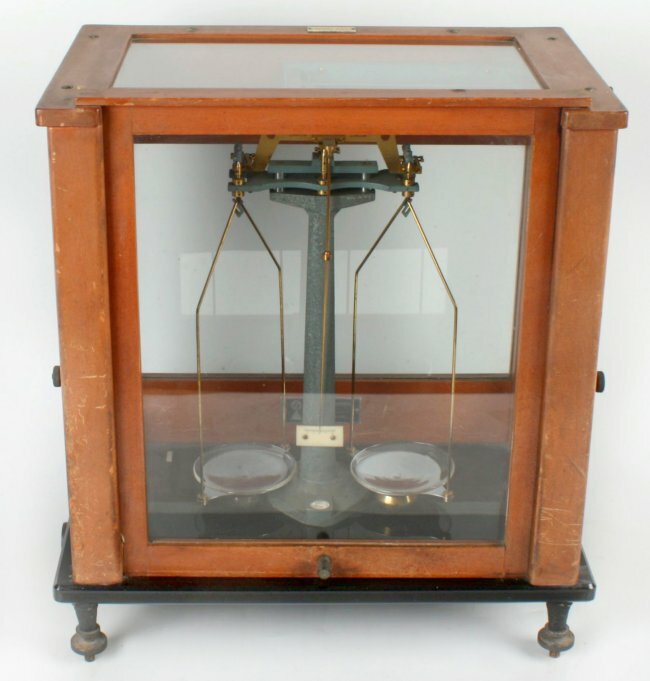 We had chemical balances that would weigh to 0.001 grammes. The balance was in a box like the picture above. It was so accurate that it was sensitive to air movements. Normally we knew what the result of the experiment would be, having done the theory. But for A Level we developed a complex flowchart of tests to identify a simple sample. The A Level included a three-hour practical exam – we were allowed to use our flowcharts. He was by far the best teacher at ICHS, on a level with the revered Mr Adlam from Highlands. As for Chemistry, lessons were mainly practical. Tonks instilled in us the need for rigour in experimentation – often doing things in two or four directions and averaging results. We had to write up each experiment formally in a special exercise book. Unlike all others (small 80-page standard school exercise books) the Physics practical books were black, larger and semi-hard bound. In describing the apparatus everything had to be included. For work with electricity this always included dccccw – double cotton-covered copper connecting wire. It was well before the time of plastic coated electric cabling. Physics included electricity, heat, light, sound, and things like Hooke’s Law – for the expansion of a wire under stress. They controlled the boys in school dinners and made sure that only those with notes from parents could leave the school grounds at lunch time. I can’t add much to what I have said already to represent what happened in the Sixth Form. 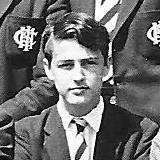 After about the first year I always walked to and from school – about two miles each way – and I gave up school dinners. In the Sixth Form we didn’t have the 32-strong forms but were in smaller groups, and I mostly associated with those doing Maths and sciences. Sometimes a few of us went to the Curry Emporium at Gant’s Hill. It had just opened and was for many people their first taste of Indian cuisine. A prawn biriyani cost, I think, 8s 6d. (That’s 42.5p) I liked it with chappattis. You can read about my initiation into alcohol with a few school friends. I spent too much of my spare time in the Upper Sixth form playing Three Card Brag, something like Poker but with just three cards. Stakes were very small staring at a penny. (That’s an old penny, less than half a modern penny.) I wasn’t particularly good at it. Finally this is me, a bit earlier than the Sixth Form. Categories: Education, Pictures | Tags: Chemistry, Curry Emporium, education, Gut Fawkes, ICHS, Mathematics, Physics, Sixth Form, Sixties, Tonks | Permalink.